Gisagara volleyball team players seen in action in the local league. Gisagara lost their opening game to UCU of Uganda at the Africa Men’s club championship in Egypt. 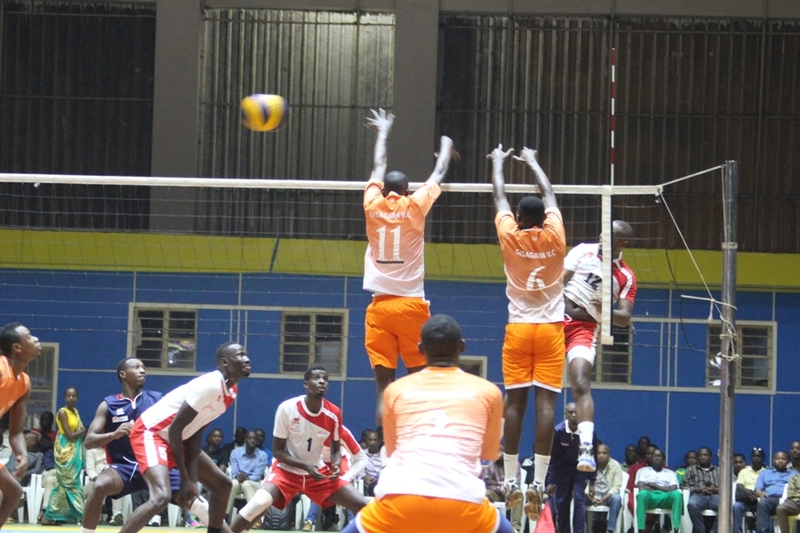 Rwanda’s representative Gisagara volleyball club opened their account at the 2019 Africa Men’s Club Championship losing their Pool B tie against Uganda Christian University (UCU) on Monday at Ahly hall in Cairo, Egypt. The Rwandan side lost to UCU 3-0 (25-21, 25-23 & 25-21) in straight sets to obscure their chances of realizing their dream of qualifying to the next round. The Ugandans impressed from the start with powerful spikes which the Gisagara blockers couldn’t defend. Easily winning the first set 25-21, the Ugandan outfit claimed the second set 25-23 but the Gisagara side tried to improve their attack but UCU proved to be a better side with good defence to seal it at 25-21 to claim the third set. Action continues on Tuesday with Gisagara facing Al Ittihad El Masrati of Libya in the second Pool B match scheduled to be played 16h00 after another tie which will pit Gendarmarie of Madagascar against UCU of Uganda which is due at 15h00. For Gisagara to be able to qualify to the next round, they need to win their remaining matches. In other results secured by press time, Kenya Prisons marked a great start following their straight sets 3-0 (25-14, 25-20, 25-23) victory against Ethiopia’s Wolaita while Libyan giants Swehly overcame Rukinzo (Burundi) with a come back in the second set to win Pool C encounter 3-0 (25-13, 25-23, 25-14). Still in Pool C, VC Espoir of Congo opened their account in the 2019 Men’s African Club championship with a 3-2 (25-15, 25-23, 19-25, 19-25 15-10) hard earned 5 sets thriller win. In Pool A, Nemo Stars from Uganda came from behind twice to beat University of Zimbabwe 3-2 (23- 25, 25-14, 28-30, 25-22, 15-10) while Botswana Police came with goods in their opening match against Ethiopian Mugher Cement as they had a thrilling victory 3-0 (25-15, 25-16, 25-17).